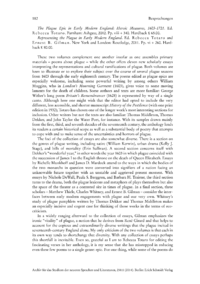 The Plague Epic in Early Modern England: Heroic Measures, 1603-1721. Ed. These two volumes complement one another insofar as one assembles primary materials  poems about plague  while the other offers eleven new scholarly essays interpreting the representations and cultural ramifications of plague. Both volumes are keen to illustrate or to explore their subject over the course of several plague seasons from 1603 through the early eighteenth century. The poems edited as plague epics are especially welcome, including some powerful writing by among others William Muggins, who in Londons Mourning Garment (1603), gives voice to some moving laments for the death of children. Some authors and texts are more familiar: George Withers long poem Britains Remembrancer (1628) is represented by way of a single canto. Although here one might wish that the editor had opted to include the very different, less accessible, and shorter manuscript History of the Pestilence (with one print edition in 1932), Totaro has chosen one of the longer works most interesting sections for inclusion. Other writers but not the texts are also familiar: Thomas Middleton, Thomas Dekker, and John Taylor the Water Poet, for instance. With its samples drawn mainly from the first, third, and seventh decades of the seventeenth century, the anthology lends its readers a certain historical scope as well as a substantial body of poetry that attempts to cope with and to make sense of the uncertainties and horrors of plague.